CC72158 works the 16:42 Paris - Belfort seen here at Langres approaching journeys end. It was up early to head to Dover to get across to France. The plan to go the 'traditional' way to Paris was already in tatters as engineering works had the Boulogne blocked for our chosen train down to Paris. South Eastern's service from Victoria to Dover Priory was a bit of a stagger but with an on time arrival we decided we just about had time to walk to eastern docks for the boat. We were right- we did *just* have time. The bus to the boat leaving minutes before our departure. It was a grey crossing over the channel on board the 'Pride of Burgundy'- this is however a sedate and pleasant way of travelling. Less sedate and pleasant was the dash across to Calais Ville for our TGV into Paris. We knew that we had not allowed a huge amount of time, but with the boat arriving around 10 minutes late and then the usual faf to get onto land we had only around 18 minutes from clearing customs to the departure of the 13:25 from Calais Ville to Paris- I knew I could just walk it in 20... so we ran it. Arrival into Paris Nord was on time now in beautiful sunshine. There was a bit of time to kill, photograph BB22333 and BB22244 and to stock up on supplies before heading over to Est. Note that one side of the nice old 'Solari' board at Nord has been covered up- maybe the beginning of the end for this nice old display? CC72176 was on the blocks, with winning CC72158 provided for the 16:42 Paris - Belfort. Settled into a comfy bay in the steaming hot first coach for the run. Clearly there was a problem with the A/C and about 30 minutes into the journey the chief du train came round and opened the windows- a little bit more noise from the loco then! On time arrival in Belfort and about an hour to explore the town and get some food before the sleeper. There was some sort of festival going on by the river- clearly Belfort was the place to be. Unfortunatley the kebab shop across from the station was not the place to get dinner. I had incorrectly assumed that getting food here would be fast- this was not the case. 25 minutes after having first stood behind the counter and just 5 minutes before the sleeper was due to leave I was finally handed my food. No chance for a shot at Belfort then! Loco was another winner- CC72147. Usual farce settling into our beds- door to the compartment was locked from the inside and once the incumbents had finally opened it we were greeted with a rammed compartment with 5 beds occupied with bodies and the sixth stacked full of luggage. I don't think our presentation of reservations for the bottom two went down too well! A little while later and some re-arrangement of the compartment and our beds were cleared- though no room for our bags. We were tired and fortunately the compartment was a reasonable temperature. After the diesel had left at Culmont-Chalindrey it was time for some shut-eye. 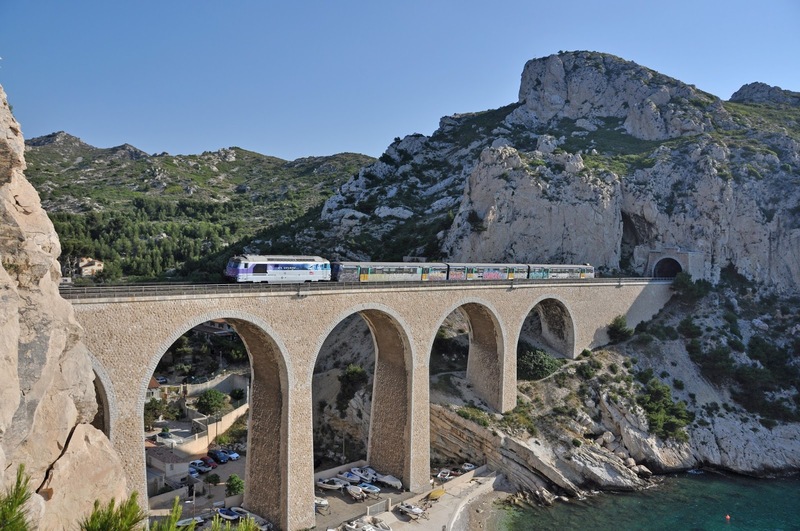 Didn't check the electric loco as I could of course see that at Marseilles in the morning. overnight sleeper at Marseilles St Charles where it reverses. A reasonably good night's sleep considering I can't sleep on sleepers! 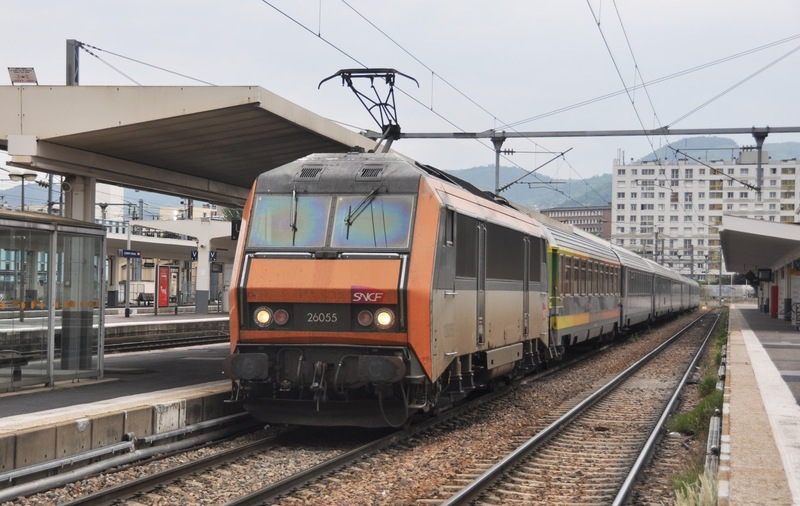 Plan to check the loco at Marseilles could have gone better... BB22326 was on the front of Sybic BB26165, which was clearly dead. But was it dead leaving Culmont-Chalindrey? Can I underline it?? BB22374 lead the train out to Nice before an odd 'definitely not in the UK' move where the broken-nose pushed the dead Sybic out of the station- nobody in the cab of the leading loco! Time for a brisk walk down to the harbour and back, and then a rather bad photo of BB7258 and the AVE bound for Madrid. Also sighted a Regio 2N set which looked to be testing. First time I've seen one in the flesh. 08:06 to Mirimas was a unit- the first bowl out of the trip. Got into position at Niolon for the 07:59 ex Mirimas. Everything crossed that it would produce a loco, and very pleasing to see BB67568 cross over the viaduct- especially given our disaster on this line exactly a year ago when the whole day fell into chaos due to a PACA strike! A quick dip in the Med to celebrate having finally got the shot. Expected the same loco to work back on the 10:36 Marseilles- Miramas but of course it didn't- even more graffitied BB67560 however was a winner and suitable substitute. BB67568 crosses the viaduct at Niolon with the 07:59 Miramas - Marseilles 'Cote Bleu' service. Infra liveried BB67433 at Miramas. in the middle... but would loco and stock work the two portions? It was worth a go. The squeal of brakes as we came up the stairs confirmed our fears- it was to be an AGC to La Bastide. The replacement coach between La Bastide and Langeac was prompt and no hassle- but the 1hour 40 + journey was really not idea for a rail trip. 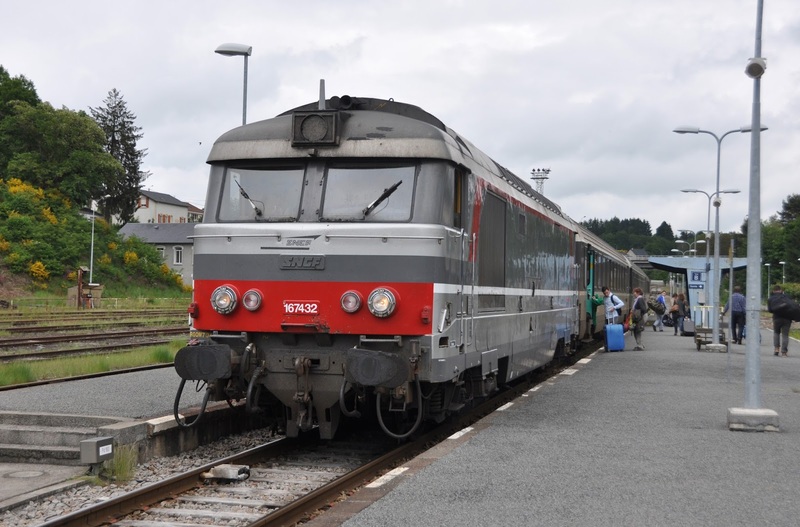 Less ideal again was another AGC waiting at Langeac to continue to Cleremont-Ferrand. Cevanol still very much required. from the yards at Miramas. Not a lot at Cleremont-Ferrand, no diesels out and just BB26055 on a Paris train so retired to a shower and a good (if slow) meal at our favourite Crepe restaurant. unable to connect to WiFi- but got the job done. 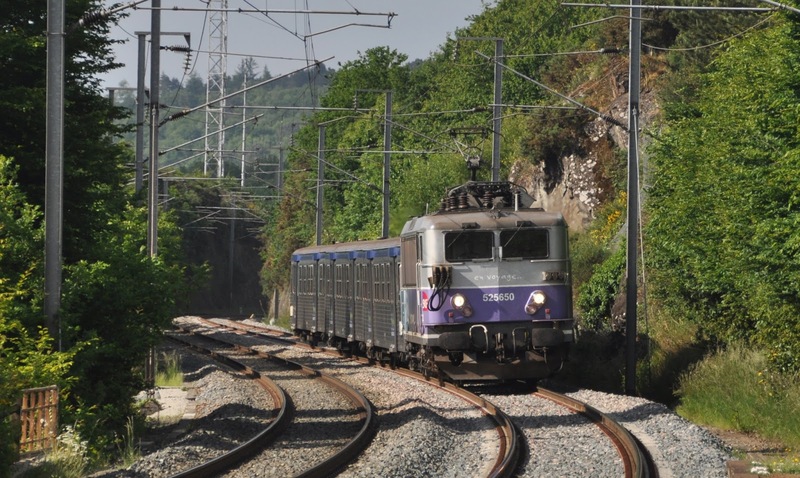 BB26055 at Cleremont-Ferrand with a Paris service. A single coach X73500 works the daily train to Le Mont Dore seen at Laqueille. the cab for the journey back down the line- we were the only passengers on the train anyway! With the line climbing straight up almost the whole way to Volvic, I'd like to come back and do it loco hauled! Limousin excursion to Montlucon. A pleasant surprise! Between Laqueille and Ussel the only option is to take a bus. Vermillion BB26037 at Cleremont on an arrival from Paris, then- a surprise! What is this appearing from the south??? A L'autorail Limousin excursion to Montlucon using X2907 and X2844. Not the best of places to photograph it and it had started to rain, but a very nice surprise and break from the monotitny of AGC's and 'flying bananas'. Todays main move was to Bordeaux via Ussel and another bus. 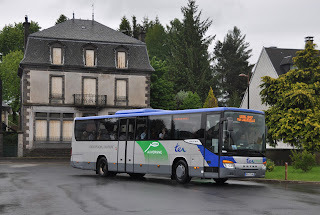 We had worked out that taking the (once daily) train to Le Mont Dore would cut down the bus journey significantly and this worked well with a 'flying banana' taking us up the pleasant branch. 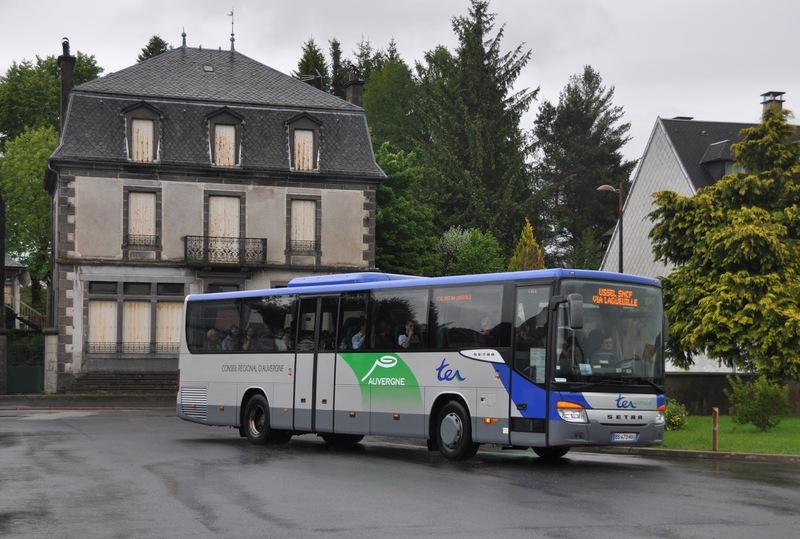 You can continue all the way to Le Mont Dore, and then return to Laquille by TER bus, conecting with the TER bus to Ussel. We didn't risk it but it would have worked as the bus connection made. Boarded the reasonably busy TER branded bus to Ussel (never did find out what happened to the two cyclists who were refused boarding) and contemplated our fate- would we get another long distance unit bowl out? Not this time. BB67432 + 3 was provided for the twice weekly 16:11 Ussel - Bordeaux running on the Monday vice Sunday due to the Holiday. train to Bordeaux Saint Jean. underneath one coach at Tulle during the run round). Arrival in Bordeaux roughly on time. Trains reverse, and our loco must run around at Tulle. As has been mentioned before there is a massive re-building program at Bordeaux St Jean with the north half of the station totally obliterated by scaffolding. It is going to look stunning once the work is complete, but in the mean time the station is a total mess until at least 2017! 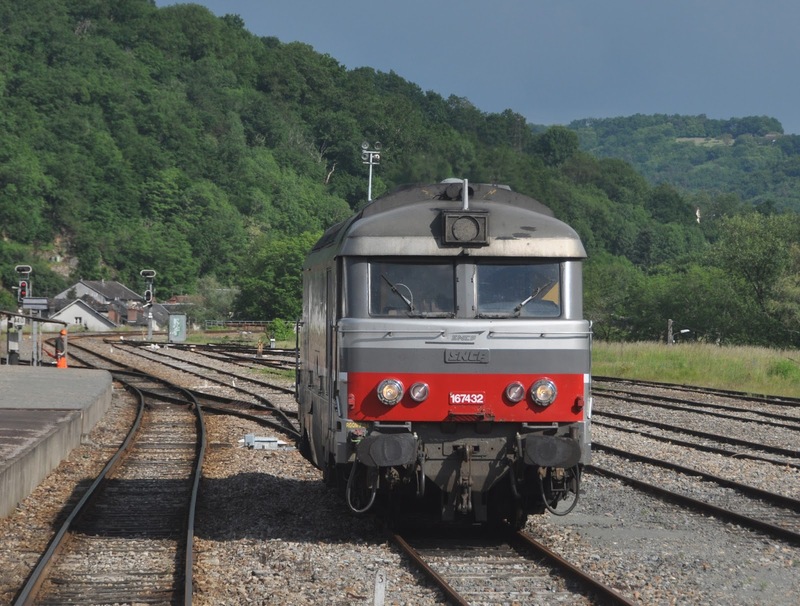 A Regio 2N set was seen in service. Turns out it's a long walk into town- should have got a tram! Ended up eating by the station. Stayed in Hotel Fasian, right opposite the stations main booking hall. Creaky floors and a tiny bathroom with a translucent door which, if shut too far (not closed) would then not re-open from the inside! A useful feature! WiFi only seemed to work down in the foyer. Other than that ok and can't be faulted on price or proximity to the station. 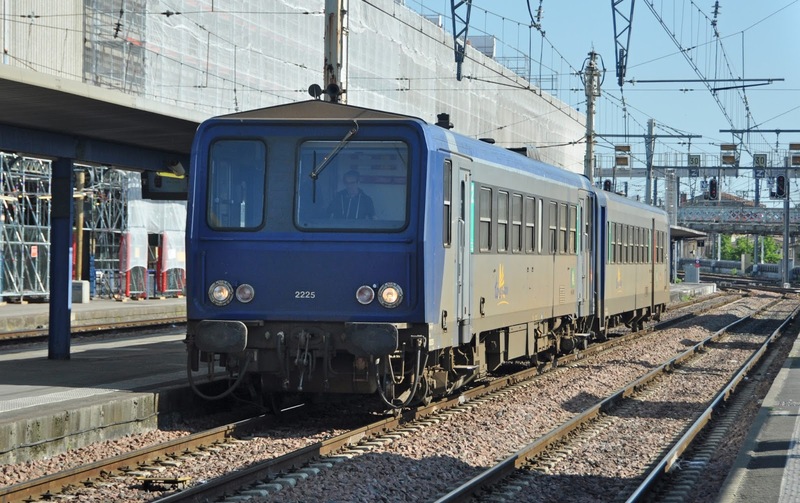 BB22331 stands at Bordeaux Saint Jean with a northbound service. 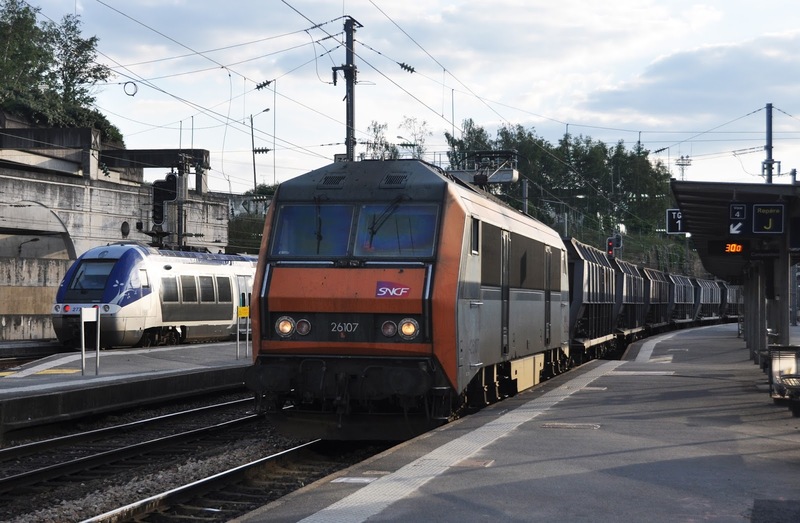 BB67419 and BB67431 arrive into Rochefort with the 06:11 Quimper - Bordeaux. 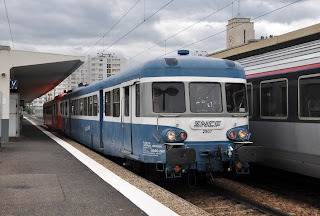 A day out on the Nantes- Bordeax line. 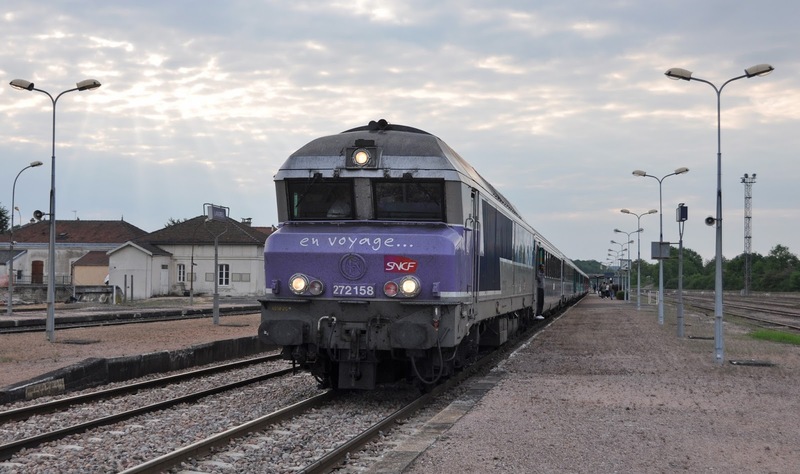 BB67419 and BB67431 at Saintes. A plan was devised working with the limited service of 4 Intercities trains each way. Not many booked for pairs on a Tuesday from the diagrams I had, but with it being a 'Sunday' on the holiday Monday there was hope of some extra pairs returning south. First move was out to Rochefort on the 07:55 unit. Another long run on an AGC- if only these trains were as smooth as Corails they would almost be quite pleasant (oh, and if they could sort out the automatic sensor taps to give you a second dose of water)! Unfortunately they rattle and don't ride jointed track too well at speed making postcard writing somewhat tricky. Y8101 is seen parked with some wagons at Lucon. Once on the line it is not so difficult to devise moves to cover most of the trains, though getting photos as well without a car is challenging. Shunter 8101 was sighted on some ballast wagons at Lucon-it had gone by the following day. 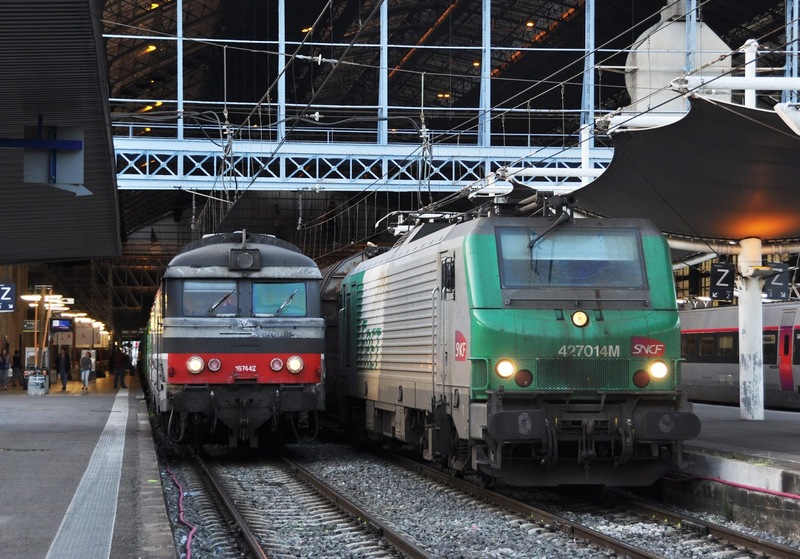 A matching pair of locos, BB67436 and BB67442 on the 10:55 Bordeaux - Nantes. very good burger and chips for dinner. Into Bordeaux for the evening- taking the tram this time to actually find the city centre. 67442 in Multiservice). All others being an En Voyage/Multiservice pairing. 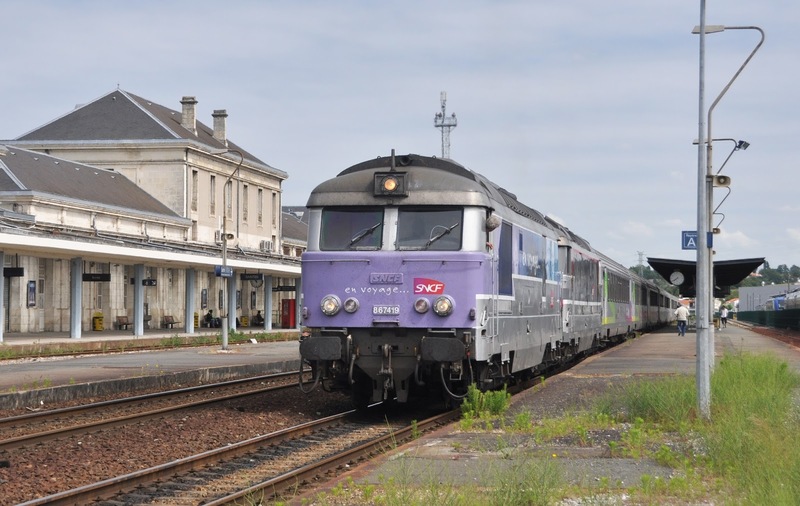 BB67424 + BB67578 at La Rochelle with the 13:05 from Nantes. 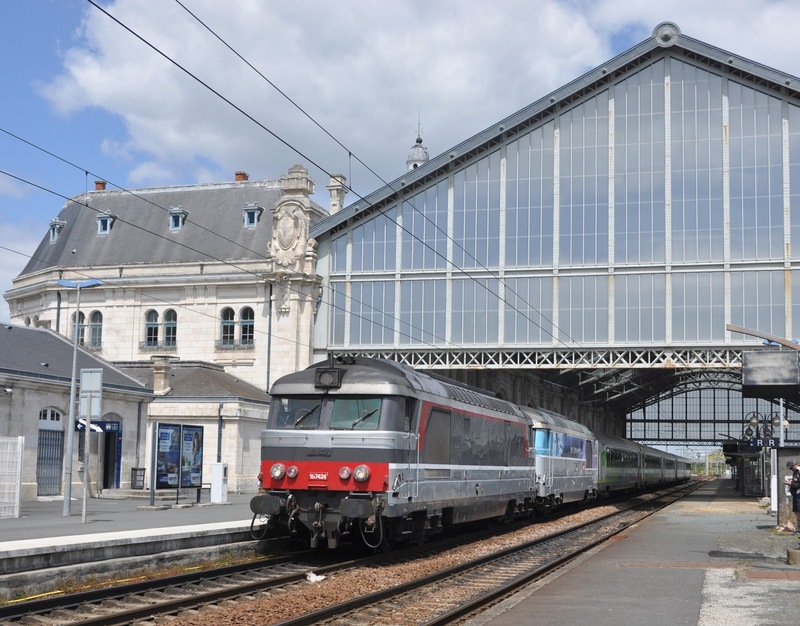 BB67442 stands next to BB27014M at Bordeaux Saint Jean. BB67445 and BB67477 head north towards Jonzac with the 16:55 Bordeaux - Nantes. 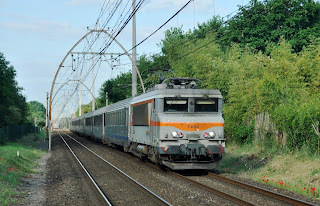 TGV 334 leads 321 under classic Midi catenery at Allouette-France on the line from Bordeaux to Dax and Hendaye. The 06:00 Hendaye - Bordeaux with BB7404. Midi catenery. 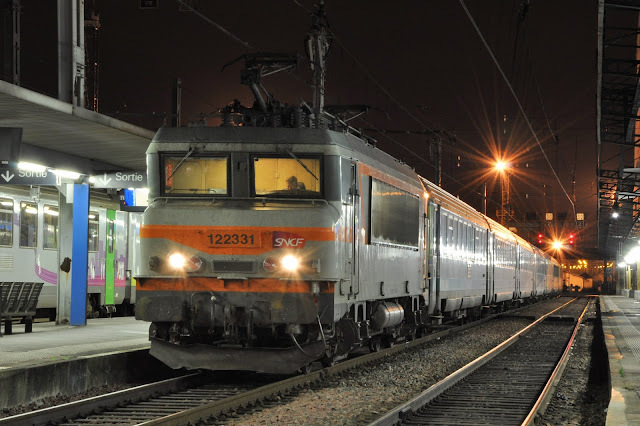 The most interesting train seen was BB7404 (with cast numbers) on the 06:00 Hendaye - Bordeaux. Of course the photo was obscured by a tiny cloud which cleared 30 seconds after it passed. A few freights were also seen (Primas BB27009, BB27013M and BB60019) as well as a Regiolis working TER services. 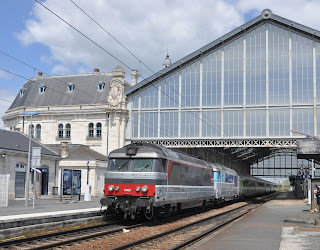 BB67578 and BB 67424 run around their train at Nantes ready to form the 17:05 service back to Bordeaux. from Bordeaux. X2225 is seen departing ECS. My companion for the week left here by TGV to Paris. Thanks Rhys for the company, I continued by unit to Rennes in search of some BB25500's. The diagrams I was working with dated to 2012, but with these I made a plan to get in 5 locos during the evening. This soon went wrong after the first two departures I was expecting to be hauled produced units (several Regiolis working in the area). BB26107 passes Rennes with eastbound freight. I took the 17:40 to Vitry and then made a massive error. I bailed at Les Lacs planning to pick up the 18:01 return from Vitry to then do a few more moves from Rennes. Unfortunately this station has only the level crossing to cross between platforms and the barriers were already down for my return train! No matter... 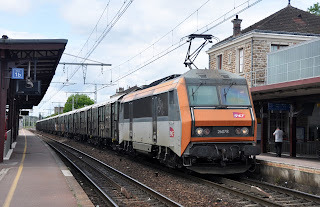 I could take the BB25689 back to Rennes on it's return- only it doesn't stop!!! 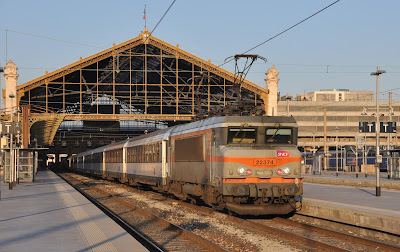 A quick panic and look at my Interrail journey planner revealed that I had indeed made an enormous balls up- the next train anywhere was the 19:23 to Rennes, and that missed all the remaining loco hauled departures! Oh dear- lesson maybe learnt about doing short desperate leaps at shacks?! BB25650 pushes and RRR set for Rennes through Les Lacs. Went for a wander around the pleasant town and had a very nice meal to commiserate. Accommodation was Hotel Magenta, just round the corner from the station. More than I ideally wanted to pay, but there was nowhere else cheaper without a massive trek- glad I paid the extra to stay near the station in the end. No creaky floor here but still no luck with WiFi! BB25689 on the banks of La Vilaine near to Guichen-Bourg-des-Comptes between Rennes and Redon. It was up very early this morning to try to make up for the previous evenings disaster! It didn't start well with the 06:15 to St Breiuc producing a unit- I had even seen the diagram that should have formed this hauled the previous night! 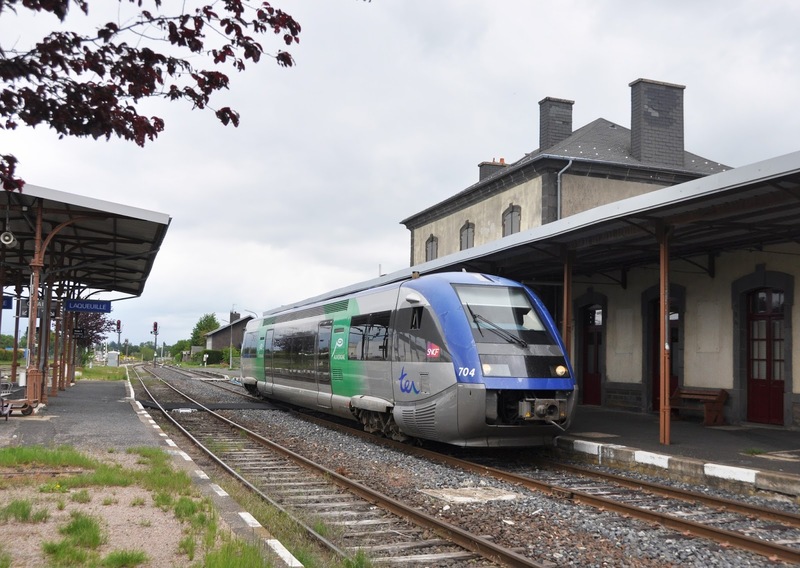 Still I persevered to Montauban de Bretagne to pick up the return 06:10 from St Breiuc to Rennes. This had to be a loco, and was BB26590. 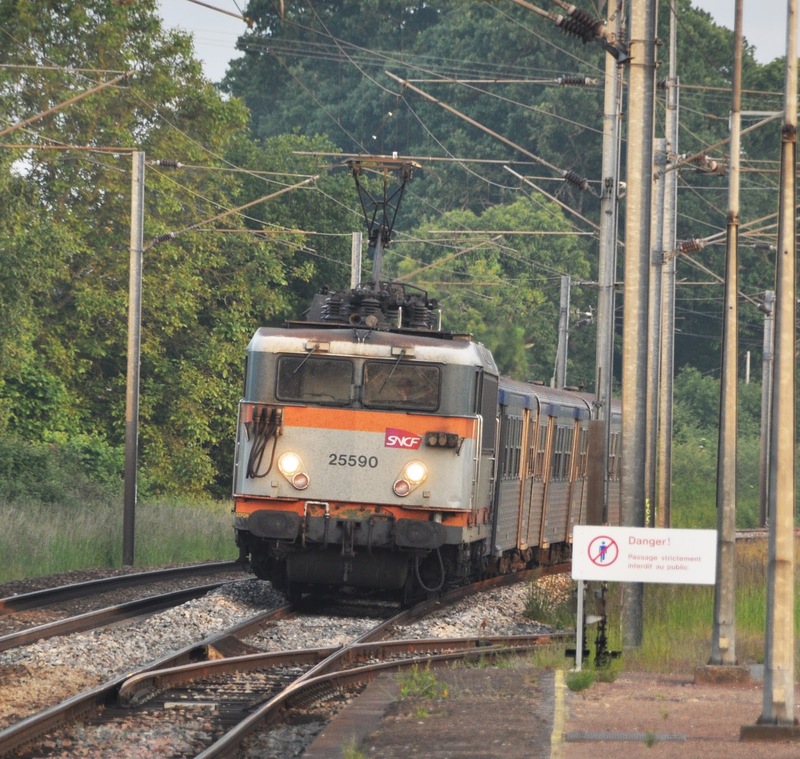 BB25590 arrives into Montauban de Bretagne. Took a unit to Sesson Cevigne to pick up BB25689 on a fill in move back to Rennes on the I had worked out fairly confidently by now that only diagrams 8-12 were still loco hauled, with 1-7 all being units. 07:20 St Malo - Rennes, diagram 1, just to ruin my assessment of what was running! 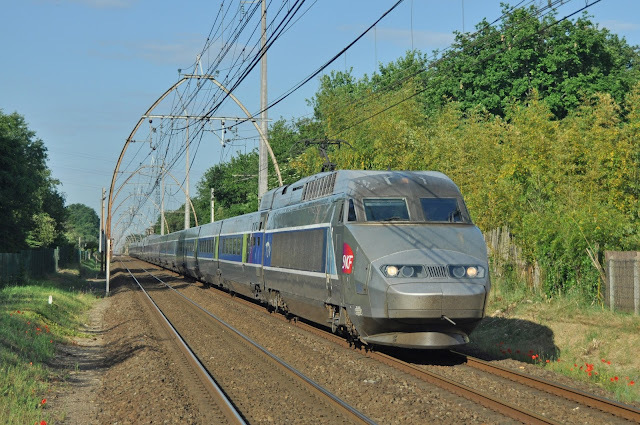 Happy with a very nice photo of BB25689 (all had been right into the sun the previous evening) I boarded the 10:35 TGV for Paris. 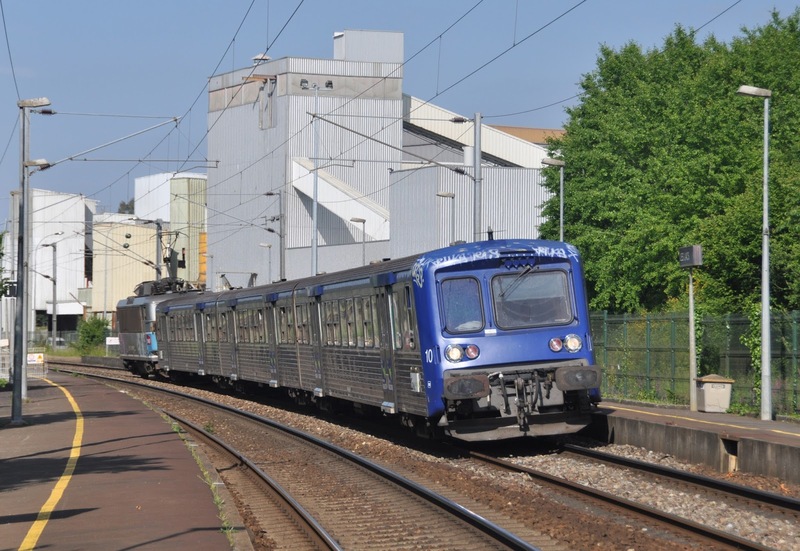 BB25681 arrives into Rennes from St Malo. 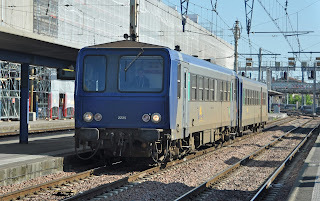 thwarted when my line 6 metro train slammed on the brakes and went very dark on leaving a station on the way towards Gare du Lyon- I needn't have feared the worst as the driver soon had the unit back into life and I had plenty of time to make the unit down to Melun. 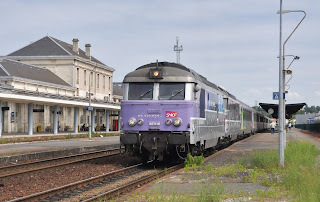 A little wait for the Z5300 units to turn up during which time 26007 passed with a Corail to Cleremont-Ferrand (only the second 'ghost' photographed on the trip- a very plain looking train when coupled with 'Vermillion' corails). Also BB26078 and BB64633 on freight. in my short visit, the highlight being original (ish) condition Z5332 with a Juvisy service- complete with brown interior and smoking passengers! A real blast from the past! Back at Melun 66205 passed with a freight and I boarded BB7241 with a train from Laroche Migennes back into Gare du Lyon. En Voyages liveried BB25650 approaches Guichen-Bourg-des-Comptes with a train from Messac-Guipry to Rennes. 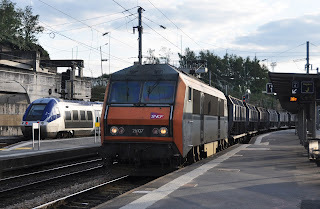 BB26078 with a southbound freight at Melun. CC72074 was viewed on rear of stock heading into Paris Est at about 17:08 (viewed from La Ferte Milon train) with BB17102 leading in. Presumably stock for the 18:12 departure? 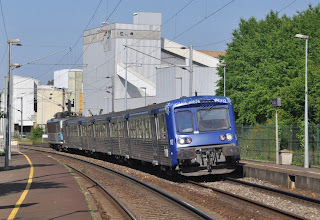 CC72049- totally caught me by surprise when my unit back to Paris passed it LE outside Trilport just where the line from La Ferte Milon joins the electric line. Lights were on and lpoked Paris bound- presumably to Pantin? But where from and why? Unfortunately I didn't have time to see what it did next. Maybe one day I'll actually get a photo or a ride with one! I had a leisurely wander across to Nord, with a McDonalds to finish the trip before boarding 3215 on the 20:40 Paris - London. depart Melun for Juvisy in the Paris suburbs. 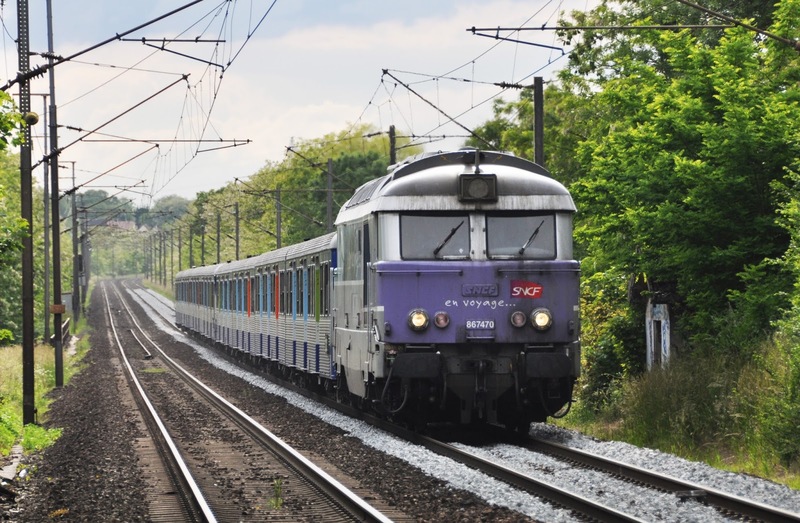 Overall generally a very good and successful trip- excursions such as these are always subject to the perils of the weather, delays, unforeseen muck ups and of course SNCF itself. 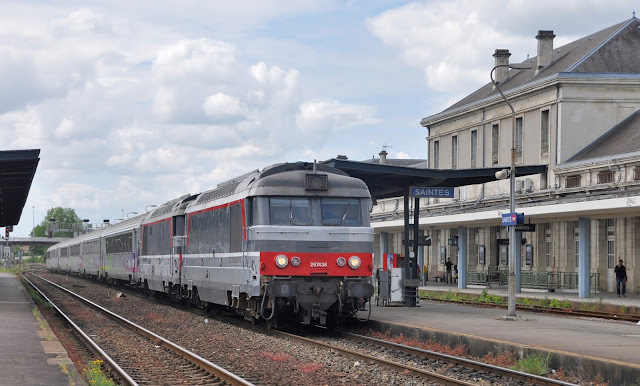 While Cleremont-Ferrand was once again disappointing, generally the weather was kind to us and to give them fair credit SNCF performed admirably. The largest delay encountered was about 5 minutes, and that was only once. Even the 'TER Car' services which unfortunately had to be endured were punctual. Once again no problem with photography anywhere- staff and the French in general being very polite and pleasant. The interior of X5332 harks back to bygone days of the SNCF! Travel was by Interrail one country pass. Journey log filled in religiously but never looked at or requested by the grippers- it provides quite a good record of the moves though. The journey log is clearly not designed for desperate moves to shacks with long names though, or even rather larger shacks such as Cleremont-Ferrand which does not fit in the box. Until next time- thanks for reading, thanks to all those who post gen and diagrams and I hope I haven't rambled on for too long! BB67470 approaches Trilport with the 18:05 Paris Est - La Ferte Milon.